Indian High Commission in Pakistan gave a demarche to Pakistan Ministry of Foreign Affairs on Wednesday eevning seeking immediate and safe return of Indian Air Force's MiG 21 pilot who was taken into custody by Pakistan on Wednesday after his fighter jet crashed inside Pakistani territory. 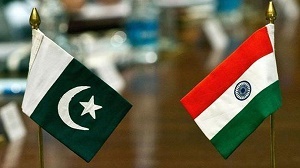 It is to be noted that Pakistan's acting High Commissioner in New Delhi was also given similar demarche on Wednesday. Earlier in the day, the Ministry of External Affairs had said that a MiG-21 had been lost while a pilot was missing after Indian forces repelled three Pakistan Air Force jets which had violated Indian airspace. The Indian Air Force had shot down one Pakistani F 16 jet. Later, Pakistan released the footage of captured IAF pilot, prompting an immediate response from India with the government slamming Pakistan for the vulgar display of the injured IAF polit. Pakistan government claimed that the captured IAF pilot has revealed his identity as Wing Commander Abhinandan Varthaman. As tension between India and Pakistan mounted during the day, the entire airspace north of New Delhi was briefly "vacated". Nine airports in Jammu and Kashmir, Himachal Pradesh and Punjab were closed for civilian traffic for some part of the day but was opened in the evening. Sources claimed that the PAF jets had entered the Indian territory to target an Indian Army Brigade headquarter and an oil depot but had to beat a hasty retreat after IAF jets came into action. The PAF's jets only managed to drop their non-guided bombs at a considerable distance from the intended areas. "In that aerial engagement, one Pakistan Air Force fighter aircraft was shot down by a MiG 21 Bison of the Indian Air Force. The Pakistani aircraft was seen by ground forces falling from the sky on the Pakistan side," MEA spokesperson Raveesh Kumar said on Wednesday evening. "In this engagement, we have unfortunately lost one MiG 21. The pilot is missing in action." Meanwhile, Prime Minister Narendra Modi met the three service chiefs on Wednesday hours after Pakistani aircraft violated the Indian airspace. During the meeting, the three services chiefs apprised the PM about the country’s preparedness to deal with any possible retaliatory action by Islamabad. http://rabotaonlinefree.ru/zarabotat-v-internete-na-frilanse-bez-vlozhenij-novichku-kwork/ - , http://rabotaonlinefree.ru/zarabotat-v-internete-na-frilanse-bez-vlozhenij-novichku-kwork/ - . !! !